Airport to hotel tranfer by our English-speaking guide, who will hold your name sign for you to recognize at the exit of the airport. A full day sightseeing today for the main attractions of the city. Sun Yat-sen Memorial Hall, an traditional octagon-shaped building, built in memorial of the founding father of modern China-Sun Yat-sen. Six Banyan Tree Temple is one of the four famous old Buddhist temple in Guangzhou, named by the great poet-Su Dongpo. Beijing Road Pedestrian Street is a main shopping district of the city. Zhujiang New Town is impressive with many high-rise business buildings. Guangzhou is a historical city. The Chen Clan Academy used to be the a place both for offering up sacrifices to ancestors and for their offspring likewise to study hard. It is now Guangdong Museum of Folk Arts and Crafts. Nanyue King’s Tomb Museum is the tomb site of the second king of Nanyue, Zhao Mo (r. 137 BC – 122 BC), housing many valuable funeral objects. Qingping Market is a famous traditional market in Guangzhou, and the first government apporved market for selling Chinese herbal medicines. 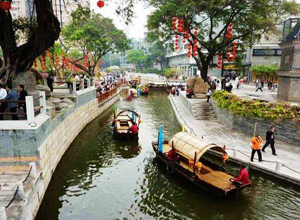 Lizhiwan Creek, located in the historical Xiguan District of Guangzhou, was listed as one of the eight scenic spots in Guangzhou. Visit the scenic Yue Xiu Park before being transferred to Guangzhou airport for depature. Wish you a nice trip!